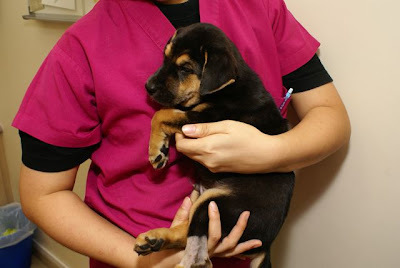 Bear Bear the Fearsome Rottie: 3 month old Tripod is needs a home! Meet Tripod. The 3 month old Rottie Cross. 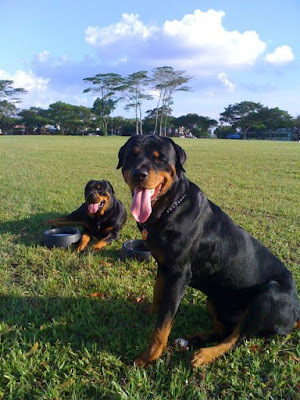 The markings might change in the future, but looking at the temperament as well as the size of his remaining paws, its likely he has a Rottie blood in him. The Taxi uncle spoke to the clinic, and somehow decided that he would cover the entire bill for treating the dog. However, he couldn't adopt the dog after he gets well as his situation didn't allow it. 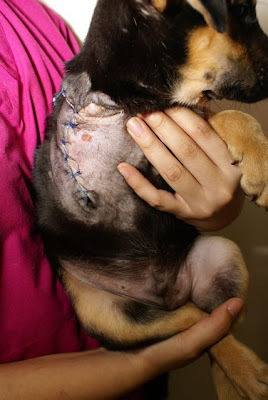 All Pet & Aqualife Vet Clinic also decided to waive some of the major charges like the entire surgery so that the bill was a little more affordable. Tripod came in like a champ. 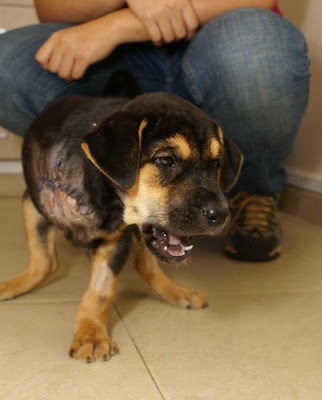 His right paw was totally gone, the broken bones were jutting out, maggots infested his flesh. As the staff of the clinic cleaned his wound, they had to cleanse and purge a massive amount of dirt and grime and maggots. Amazingly, Tripod with a little complain, didn't bite or was defensive. And till date, remains fantastically affectionate. He even comes toilet trained. Not a SINGLE time did he pass motion or even PEE in his own cage or holding area. He would call to be put on the grass where he would do his business. It would be about a week before he is ready to go to his new home. Please help pass this message around... a small contribution to the taxi driver would be a great thing. He helped where he didn't need to. and he put his money where his mouth is... even in these trying times with the economic downturn and all that. 4 legs, 3 legs or even 2 legs, a dog will always be able to adapt and love you no matter what. 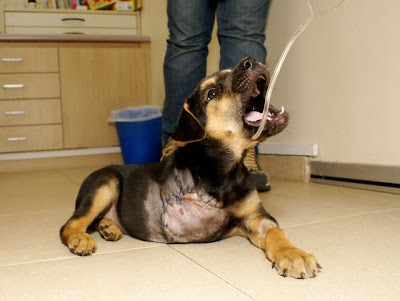 And with such a strong fellow wanting to live, he would love to be trained and loved in returned. Other from the obvious missing paw, Tripod is healthy and very very good natured. its really amazing. I will need everyone's help in putting this on your blogs and forums. Please call All Pets and ask for Mingli or email killertouch@hotmail.com if you would like to adopt or contribute a token to Tripod's medical fund. Feel free to indicate how you want your money used, however, whether it is eventually used as such is up to Pa. The Taxi driver uncle has ALREADY paid in FULL and he has no idea about all this arrangements. If he refuses to take the money, or that there is excess funds, it would be used to help the medical cost of either Tripod or any other dogs requiring emergency medical attention. Hey Tripod, see you soon on our field. We'll run and play like there is no tomorrow. Such a tough dog! I asked godpa to put up about Tripod in my blog. poor baby!!! really hope he finds a home sooN! Hey hey... next time sign off ok? We are all frenly here! we dun BITE! Cheers to Taxi Uncle too!!! i'll post your story on my blog too but i'll copy and paste!! Hey Kayla... its on the entry! its killertouch@hotmail.com! hear from you soon!! Sob so poorthing. Help u post in facebook! Jacko sends his regards too.